I was so honored when Brittany of Colure Weddings contacted me asking if I'd like to be part of their blogger team on her website's wed feed a few months back. It was an honor for Le Magnifique to be getting noticed! Anyway, they're one of my favorite sites and I wanted to share with you what they're all about! Hungry for weddings? You’ve come to the right place! 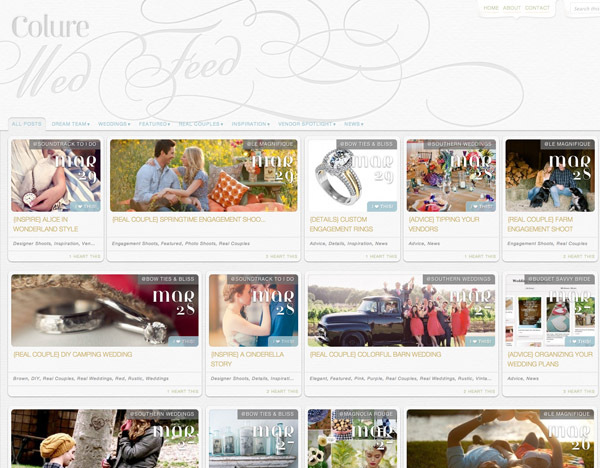 Our Wed Feed is a mouthwatering visual news feed designed to help wedding lovers find their favorite blogs and stay up to date on wedding trends and news, . Weddings of all shapes and sizes are hand-picked by a dream team of wedding bloggers (like Le Magnifique), you’re sure to find something to your taste. Each wedding photo you see featured is only a sample of the buffet of wedding goodness awaiting you on our favorite blogs. Simply point and click, and don't forget to tell us which features are your favorites by clicking on the "I <3 THIS" button! This feed was created as a resource that points wedding lovers and couples getting married to quality wedding bloggers who work tirelessly to produce the best wedding inspiration available. We want to honor those bloggers and connect as many people to them as possible. We know you'll fall in love with them as much as we have! Our Wed Feed is only a small sampling of what we are working on behind the scenes here at Colure Weddings, so stay tuned!